Like you, we hate the thought of car trouble, but car trouble happens. Roadside Coverage ensures you bounce back from car trouble with no trouble at all. You want to drive a pickup truck that will keep you comfortable and help you feel confident. The all-new mid size option from Jeep that is coming to you in the spring of 2019 could be just what you are seeking. Come to Lithia Chrysler Jeep Dodge of Twin Falls and learn more about the 2020 Gladiator. For a mid-size SUV that’s built for performance, take a look at the Dodge Journey. Whether you’re hauling passengers or towing gear, you can choose the engine and suspension that fit the job. The standard engine is four-cylinder with a capacity of 2.4 liters. It’s paired with a peppy four-speed transmission. If you need more power, you can choose the 3.6-liter V6. Combined with a six-speed automatic transmission and front-wheel drive, this engine is ready for adventure. If you are somebody who is used to the amount of flexibility provided with larger vehicles like pickup trucks, you'll be surprised at the amount of flexibility that you can get out of the Jeep Renegade. At Lithia Chrysler Jeep Dodge of Twin Falls, we want our customers to have access to popular SUVs such as the Renegade that make their lives easier, having enough space and capability to take whatever they want on the road. At Lithia Chrysler Jeep Dodge of Twin Falls, we understand that it's important to have the perfect vehicle for your driving needs. The Ram 1500, with its newly designed exterior, can be customized to suit your driving needs in our town and beyond. The front end, complete with sleek LED headlights, was created to have the lowest frontal drag coefficient in its class. The active grille shutters and air dam work at higher speeds to increase aerodynamics while still maintaining the proper engine temperature. Television stations and comedy channels sometimes show the 90s sitcom Seinfeld. One episode features the character Kramer discussing how he drives. He often takes the needle to empty just to see how far he can get before the car runs out. Dodge Durango owners who tried this might be pleasantly surprised - though we do not recommend letting your tank get that empty in any vehicle. Drivers who are looking to purchase a full-size pickup truck should check out the Ram 2500 at Lithia Chrysler Jeep Dodge of Twin Falls. This capable pickup truck offers a number of best-in-class and class-exclusive features that make it one of the top models in its class. The Ram 2500 comes with three engine options and two transmission options. The Ram 2500 offers a six-speed manual or six-speed automatic transmission. The class-exclusive six-speed manual transmission is only offered with the 6.7L Cummins Turbo Diesel engine and comes with a wear-compensating clutch. For those who are shopping for a new vehicle this year, there is a lot to consider. Many manufacturers have given their most popular vehicles a facelift to freshen up the market. The Chrysler 300 is one of these vehicles. Getting a slightly different twist on the old exterior design, you'll still be able to spot a 300 from a mile away. The new design is much more sporty than previous years. Even the front grille has received some updates. More options than ever are available. 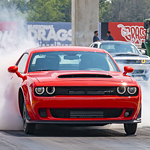 If you are someone who looks at the amount of power that is under the hood of a vehicle, look no further than this year's Dodge Challenger. This is a vehicle that has been on the market for a number of years. Since its inception, it has amazed consumers with the amount of power it provides. The base level SXT trim level comes equipped with a 305-HP 3.6L, Pentastar, V6 Engine. You can get up to 305 horsepower with this model. Where will your Chrysler Pacifica take you? What do you look for when selecting a new van for your family? Do you look for a specific style? What about the features and safety? Every member of our team here at Lithia Chrysler Jeep Dodge of Twin Falls can help you find the right combination of features, and we're excited to introduce the 2018 Chrysler Pacifica. You and your passengers can travel in comfort with the available heated and ventilated front row seats. 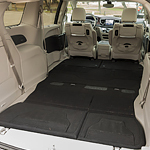 The seats on this popular family minivan allow you to stay warm in cold weather, and cool during the summers.